out with us for another backpacking adventure. 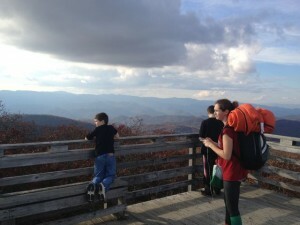 In 2010, the Great Garrett Guys Getaway was led by Jonah near Roan Mountain, but this year, Roger wanted to bring his grandkids (and their parents) to north Georgia. The trip would be called the “Garrett Grandkids Backpack Attack!” or GGBA. 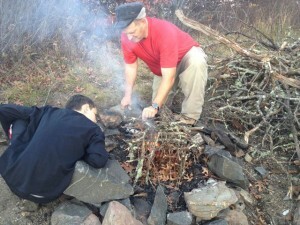 We would camped, hike, and backpack on the Bartram Trail with a stop for pizza in town for Saturday lunch. A Chick-Fil-A Surprise: Roger wanted to keep it a secret that I would be coming along, so he arranged for his family to meet at Chick-Fil-A in Clayton, Georgia to have a meal before their adventure. I showed up at the restaurant a few minutes earlier. It took Roger a minute to recognize me (my hair is thinner than when we saw each other last), but he eventually said, “Hey, don’t I know that guy?” His son-in-law flippantly said, “Sure, that’s Jonah.” (He knew me from the 2010 trip, but didn’t seem to find it unusual to run into me at a Chick-Fil-A in Georgia.) I walked over and said hi. After greeting, I told them that I was here meeting a group that I was leading on an adventure. And then they figured it out. Great job with the surprise, Roger! 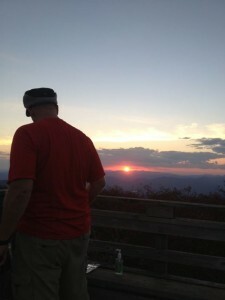 On the Mountaintop: Our first campsite was on the peak of the 2nd tallest mountain in Georgia – Rabun Bald. We decided the weather was perfect, so we didn’t even carry a tent – our plan was to sleep on top of the observation tower at the mountaintop. The weather cooperated and we got to watch a beautiful sunset and then cook hobo meals (meat, potatoes, and veggies wrapped in aluminum foil) over the fire. That night, the wind picked up and it was chilly sleeping on top of the tower. But everyone must have been warm enough, because I was the only one who moved down below the tree cover. There are not many times we get the chance to sleep on a tower on top of a mountain, so I’m glad we did it! By the Waterfall: The next day, we drove to another section of the Bartram Trail and backpacked to a campsite near Dicks Creek Falls. After setting up a tent that would sleep eight (the family all wanted to sleep in the same tent), we took a short hike down to the falls. It was warm enough to wade in the water, and the kids loved hopping from rock to rock, exploring the riverbank and the waterfall. Then we all saw Cecil strip down to his shorts and sit down in the river. We gave him a perfect “10” like in the Olympics! 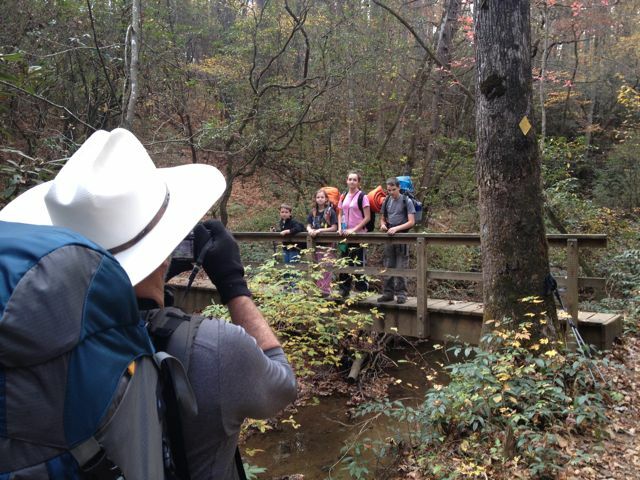 And later, our group walked to the sandy beach farther down the trail and Cecil, his son, and I all dove in. Cecil and I even swam to South Carolina (the far bank). 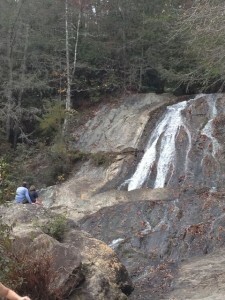 It was the latest in the season that I’ve ever swam in the Chattooga – October 27! And it was cold! the hard work we put into starting it by friction. Part of the Family: I’ve never led an adventure that was a surprise to the participants, so I was a little nervous that they’d be frustrated to have an outsider along on their family gathering. Instead, they embraced me like one of the clan. But my biggest joy was watching the family play together (throwing football in the river, climbing trees and rocks) and share meaningful experiences. Roger and his youngest grandson were the first two people up each morning, and I watched as they discussed life and got to know each other better than a usual “visit with grandpa” usually allows. Helping with this family’s adventure made me remember that our adventures are not always easy, but they help us get to a deeper place individually and in community.